All that talk of UFC not “getting” the Internet? Yeah, it’s time to put that idea to rest. 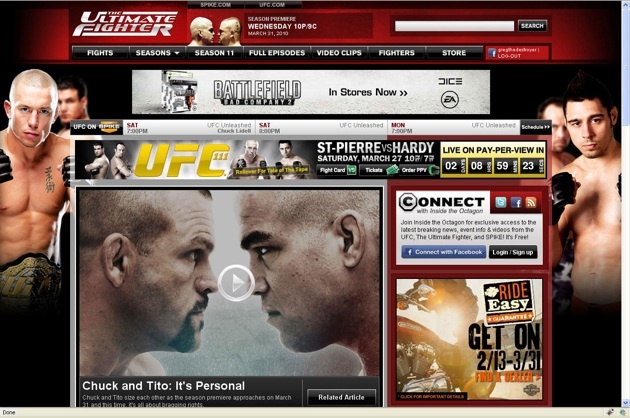 The company’s longtime TV partner, SpikeTV, launched ultimatefighter.com earlier today, a place where mixed martial arts fans can watch the entire Ultimate Fighter library online. For free. Let that sink in—still think Dana White hates the Internet? In addition to serving up all 231 fights in the show’s history, fans can also interact with each other on social networking services like Twitter and Facebook. Not a bad job, really. The site mirrors MTV Networks other “verticals,” like those associated with The Colbert Report and The Daily Show. Full episodes can be streamed, or fight fans can pick out individual fights from the 11-season library. Perhaps you fancy seeing Kimbo Slice’s first fight again? Or maybe you’re a newcomer to the sport, and want to see how Forrest Griffin made his name? It’s all there for you, free of charge. Oh, and the videos are fully embeddable. Handy. The site serves advertisements à la Hulu, so be prepared for the occasional U.S. Marines commercial. Gotta pay the bills somehow, folks. Web sites don’t build themselves. One thing to note: season 11, which begins next week on SpikeTV, won’t be available on the Web site for a little while. The current rough plan is to make the episodes available after the season’s conclusion, to sorta bridge the gap between season 11 and 12. In the meantime, though, fans can check out the Web site after every new episode that airs on TV to watch exclusive coverage of said episode. Terribly constructed sentence, yes. You know, things like post-show analysis (Dana White chips in after the first episode), unseen footage, etc. And not just “meh, lame” bonus footage, either. We’re talking full fights that, for whatever reason (time constraints, I’d imagine) never made SpikeTV in their entirety. Twitter, darling of the Internet, has been integrated into the site pretty visibly. On the right-hand side is a small box that monitors UFC-related hash tags, including #UFC, #TUF, #DanaWhite, etc. This might not seem to exciting on a random Thursday afternoon, but during UFC events—pay-per-views, The Ultimate Fighter, SpikeTV Fight Nights, and so on—the trash talking should really fly. The very idea of UFC giving away fights is pretty much unthinkable, when you consider that three-quarters of the company’s revenue comes from pay-per-view buys. In the kick-off meeting this morning, SpikeTV explained that it took “many meetings” to convince UFC brass to go along with the idea of putting fights—any fights!—online for free. We all know that UFC actively pursues people who go offer illegal streams of their events—the company just recently sued the owners of two Web sites that were offering illegal UFC 111 streams —so finally making at least some of its content available online is a move that should be applauded. Remember, this is a company that lived and died (well, mostly lived these days!) on its pay-per-view buys, so giving away fights for free may felt a little strange at first for Dana White & Co.
And now we wait for Frank Mir to choke out Shane Carwin, setting up Lesnar v. Mir II. That has pay-per-view buys written all over it.